Appreciation for Samford University as a loving and diverse community was expressed several times by alumni and guests at a Jan. 23 luncheon commemorating the 50th anniversary of the university’s integration. The luncheon followed the opening convocation of the spring semester that featured Charles L. Howard, the son of Samford’s first African-American student, Audrey Lattimore Gaston Howard. Mrs. Howard, who died in 1989, also was mentioned several times as a pioneer for others who followed her. She was Audrey Gaston while a student in Samford’s Cumberland School of Law, where she received her degree in 1970. Angel Sims, a junior psychology major from Chattanooga, Tennessee, said that Mrs. [Howard] “paved the way for all students of color” at Samford. “I thank God every day that I can say, ‘I am at Samford University’,” Sims said. “I did not know how to appreciate my degree until I graduated, and someone told me how valuable it was,” Isaac Cooper said. A 2012 graduate, he serves as president of the Samford Black Alumni Association. 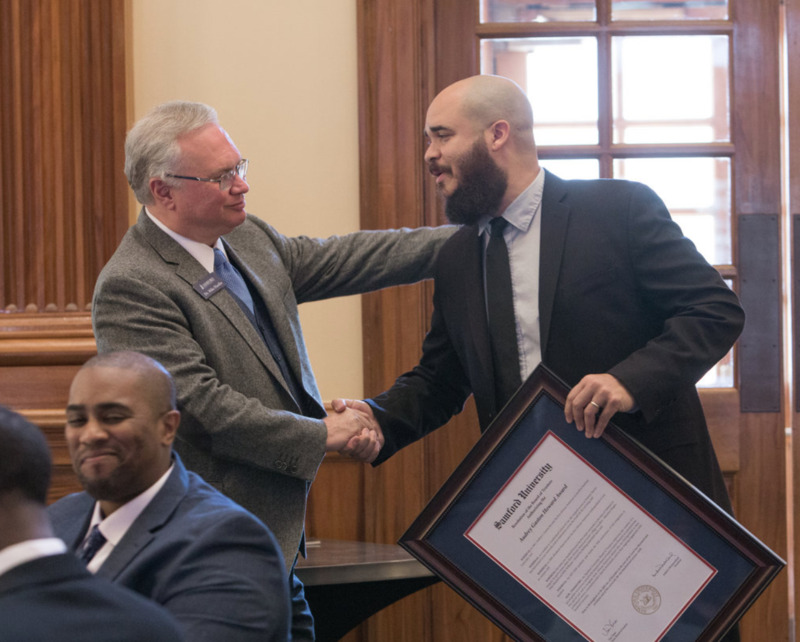 Samford Provost J. Michael Hardin presented Charles Howard with a framed resolution from the university’s board of trustees honoring his mother and announcing the new Audrey Gaston Howard Award to recognize the university’s African American alumni. Samford will recognize the first 29 recipients of the award each day in February during 2018 Black History Month observance. Several of the recipients were present for the luncheon. One of the more poignant moments came from Howard’s wife, Lia, who teaches political science at the University of Pennsylvania.